I cannot stand paper clutter. Even though I do my best to try and keep it at a minimum, it still tends to pile up. I have a mountain sitting on my kitchen table right now just waiting for me to tackle. I’ll get to it…someday. Priorities. There is one small thing you can do to manage your own paper mountain: use e-Bills wherever you can. When one of my monthly services offers e-Billing, I take it. Every little bit helps! If you are a Toronto Hydro customer, you’ll want to keep reading. They have a special promotion going on right now to wipe away your winter blues while putting a dent into the amount of paper coming into your home. 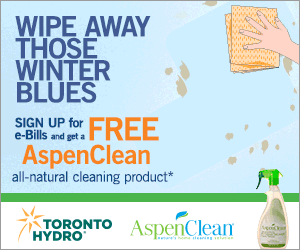 Sign up for e-Bills and you’ll get a FREE AspenClean all-natural cleaning product. 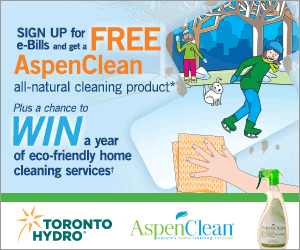 In addition, you’ll be entered to win a year of eco-friendly home cleaning services valued at approximately $3,000. This special offer ends on March 31, 2016 so take advantage of it today! eBills are meant to simplify your billing. Instead of waiting to receive your paper bill in the mail, you’ll get an email when your eBill is ready to view online. You’ll have 24/7 access to your account online and can also view all your bills for the past two years in one place. This is especially handy for anyone who has a home-based business so they can readily find their bills for tax season! Help yourself and also the environment by going paperless. Signing up is simple. Grab your current Toronto Hydro paper bill and sign up in minutes in their online self-service portal. You’ll need your Toronto Hydro account number found on your paper bill. All Toronto Hydro residential and business customers can take advantage of this service. Are you ready to wipe away those winter blues? Head on over to Toronto Hydro and sign up for e-Bills! Spread the word so your friends and family can take advantage of this special offer too. Very interesting. Hydro is so expensive these days.